Whether you’re a beginner at single-cell analysis, or have been doing it for a while, there are pointers to keep in mind to ensure you get the best results with your research. Below is a short checklist created by Dr. Ruth Kläver, QIAGEN R&D Scientist, of tips and tricks for preparing, isolating and storing your single cells that may prove helpful as you proceed with your research. 1. What should I know about my cell line to help me design my experiments? Knowing the above information about your cells will help you prevent in introducing systematic bias into your data that might later be misinterpreted as biological variation. Avoid batch effects when planning your experimental design, and create a design that is balanced, splitting multiple replicates across batches (1). 2. What’s the best way to prepare cells and achieve an even cell suspension? • Always use fresh tissue for preparing primary cells. Frozen tissue sections can be used if fresh tissue is not available. • When isolating cells from tissue, it is recommended to cut the tissue into small pieces, which can be further dissociated by pipetting up and down. Remove the resulting cellular debris using a cell filter. • If you are using adherent cells in culture, trypsinize the cells to obtain a cell suspension. Stop the process with addition of cell culture medium, and pipet the cell suspension up and down to help dissociate cell clusters to single cells. Also, minimize cellular stress by using the shortest possible trypsin treatment time. • Once cells are dissociated, be sure to observe and count them in a Thoma cell chamber or haemocytometer to verify that you have a single cell suspension. • Trypan blue staining of cell suspensions can help determine what percentage of cells are dead. 3. How should I handle my cells during single cell isolation? • Avoid mechanical stress and chemical/enzymatic stress on cells. Use technologies that keep cells viable and in their natural environment, when possible. A useful device for achieving these conditions is QIAGEN’s QIAscout Microraft Array. • When working with heterogeneous samples, be observant of varying cell shapes and sizes, and ensure that cell separation techniques are not biased towards a certain cell phenotype. • Sometimes it may be necessary to enrich for your cell type of interest, such as in the case of rare cell types. Enrichment may be accomplished through selection by size, shape or antibodies. Be aware that each of these methods does not result in a cell population that is 100% pure, and that enrichment may induce bias (2). • When isolating cells using a serial dilution strategy, cells distribute across all wells according to Poisson distribution. The concentration of your cell suspension will affect cell distribution in wells, and can result in isolating more than one cell per well, or alternatively, no cells in individual wells. • Ideally, use cells directly after isolation, and keep them on ice until you are ready to process to maintain DNA/RNA integrity. If additional time is required, snap-freeze cells in liquid nitrogen. • Observation of cells visually under a microscope during the isolation process ensures that just one single cell is isolated and there is no loss of individual cells while you are working. Using QIAGEN´s QIAscout allows such a visual control during single-cell isolation, which is one of the biggest advantages of using the QIAscout. 4. 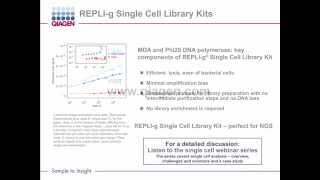 What’s the best way to store isolated single cells? • For long-term storage, snap-freeze single cells in liquid nitrogen and store at –80°C for no longer than 2–3 months. Use of –20°C freezers is not recommended as they experience temperature fluctuations that could affect the integrity of isolated cells and their nucleic acids. 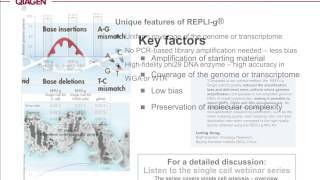 Want to learn more about single cell research? REGISTER for our Single CTC Isolation Webinar on either May 24th or June 1st ! ‹ Previous Article Join us for NGS Week @ QIAGEN! Join us for NGS Week @ QIAGEN!